Last Updated: August 17, 2018 | Subscribe to our weekly newsletter! Remember back to your childhood summers and the thrill and pure joy of jumping into water. It didn’t matter if it was your own pool, the community pool, or your favorite swimming hole. Jumping into that refreshing water was even more fun when you had the extra boost into the air from a diving board. You’d launch into the sky and perform the best jackknife or cannonball ever, having a blast with your friends and family. Now that you’re all grown up and times have changed, modern diving boards might feel a bit different than you remember. Plus, you have to consider things like safety standards and homeowner’s insurance. Even though it may seem boring and a little complex, you’ll be rewarded at the end with a fun, safe diving board your friends and family will enjoy for years to come. You could just jump from your pool deck, but it’s just so much more fun to add room to take a few steps and a little extra bounce when you jump. Diving boards range from little stone platforms to ten-meter Olympic diving towers. Unless your backyard is as big as a football field, you’re probably not in the market for a massive dive tower. Still, residential diving boards are available in a variety of styles, materials, and mounts so you can find one that fits your space safely and beautifully. They can be divided into two categories. The basic design is probably the same one you recall from summers spent at camp. Springboards feature a base with—you guessed it—springs. Sometimes they’re visible at the base, others have a cantilever design without visible springs. This is the type of board that gives you the extra power to jump high in the air and dive. It’s that extra height in your dive that means your pool must be deep enough that you won’t hit the bottom. Because diving from a springboard increases the risk of serious injuries, especially in shallow depths, this style of diving board is less common than it once was in home swimming pools. These differ from springboards in one simple way: no springs. These are the most common in backyard pools nowadays. Any diving board without springs is considered a platform because the base is fixed. You may be picturing a typical diving board with a stationary base, but that’s just one type. Manufactured platforms and field fabricated platforms are pool industry terms for variations on this style, such as diving rocks. For example, imagine a huge stone jutting out above a waterfall where tourists can plunge into the sea. Now imagine a similar stone slab on your pool deck, or even in your pool. That diving rock is another sort of platform diving board. The most important aspect of choosing the right diving board is calculating something called the diving envelope. This refers to the area in which a diver may enter the water, and the depth and distance they could travel when diving. It’s vital to be sure there’s not only enough depth directly beneath the diving board, but that the pool floor doesn’t begin to rise too near the diving area. Imagine a short pool with one very deep end. The transition from the deep to shallow end would be quite steep, like a wall in the middle of the pool that a diver might strike. The longer your pool is, the more gradual the transition from deep to shallow will be, making it safer for divers. We can’t stress enough how important the diving envelope is, not only to choose the perfect diving board but, but to ensure the safety of everyone who uses your pool. If you install a diving board that’s too long for your inground pool, and a diver strikes the bottom, they could break or injure their hands, arms, shoulders, knees, head, or neck. Injuries sustained from improper diving can cause lifelong paralysis or death. A pool that’s most suitable for a diving board will be both deeper and longer than the average backyard inground pool. The board suitable for your inground pool (unless it’s quite a large pool) would be shorter, fixed, and not as high above the water as the diving boards you see in large, commercial inground pools. 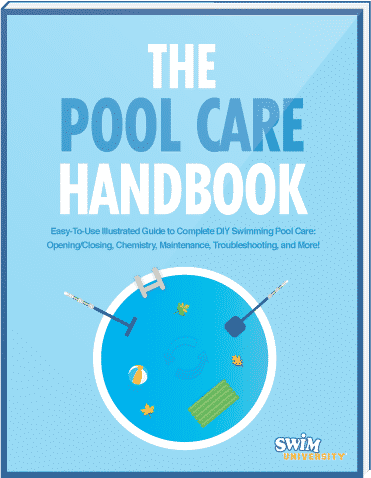 You’ll need several measurements of your pool to determine your pool’s diving envelope. You might already have some of those figures on hand from your pool builder, but if not, you or a pool pro can take them. Measuring depth in a particular spot can be tricky, especially if your pool is full of water, so you may want to leave this step to the contractor or pool pro who’ll be installing your diving board. If you’re up to the task of taking the measurements yourself, make sure you carefully follow the instructions to do so. You’ll need four specific depth measurements, four widths, and the distance between certain points. All that measuring is used to determine which type of pool you have. Diving Pool Type I, II, III, IV, or V refers to the size of your pool’s diving envelope, and determines how high your diving board can be above your water line. It also shows you whether you have any features or accessories impeding the diving area, such as ladders or waterfalls. The envelope area must be completely clear of any obstacles a person could hit when diving. Once you know which type of pool you have, you can easily find the correct size diving board or platform. Important: Be sure to brush up on safe diving techniques and smart pool rules to help you and your family get the most of your new diving board while minimizing the risk of injuries. Safety matters are serious, but choosing the right diving board isn’t all death-and-taxes-serious. Contemporary diving boards offer some exciting differences from the boring, white planks of your youth. Forget the lame boards of yore. Now you’ll find boards in sleek, stylish shapes and interesting colors and materials, such as natural stone and even wood. Some models let you choose from a range of colorful non-slip surfaces If you click this link and make a purchase, we earn a commission at no additional cost to you. .
Advances in manufacturing mean you can purchase a saltwater-pool-friendly diving board If you click this link and make a purchase, we earn a commission at no additional cost to you. for your made with materials that resist salt corrosion. You won’t have to worry about rusty springs staining your pool deck. 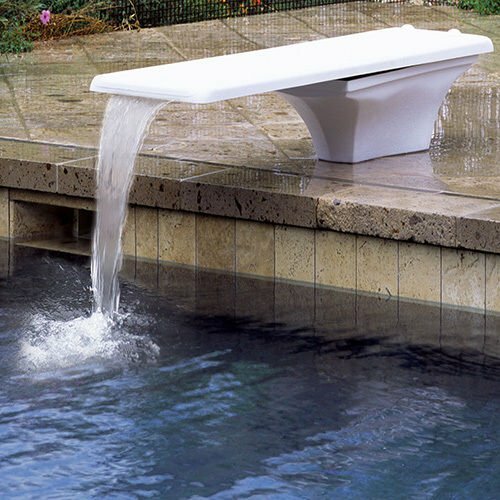 Love the look of pool waterfalls? You can buy a diving board with a waterfall If you click this link and make a purchase, we earn a commission at no additional cost to you. at the end. Some even allow you to add a waterfall assembly to an existing board, should you decide to upgrade it in the future. If water isn’t exciting enough, you’ll also find diving boards with colorful LED light strips on the ends. Beautiful mood lighting blows your old summer camp diving board right outta the water. If you’ve already added LED pool lights to your pool, this diving board will make your late night swims even cooler. 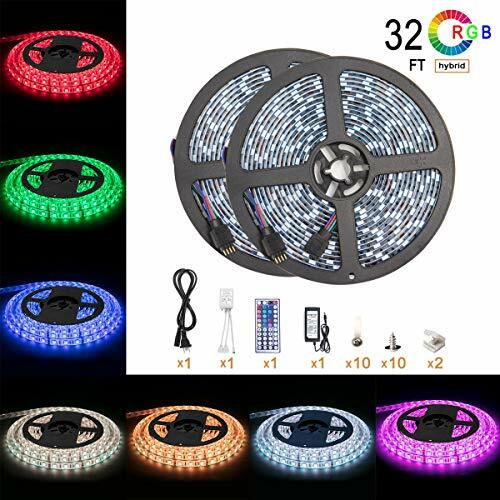 If you can’t find a diving board with built-in lights, you can always add a strip of waterproof LED lights If you click this link and make a purchase, we earn a commission at no additional cost to you. to your board, and create your own colorful atmosphere. As the responsible adult you’ve become, you must consider the mundane details of buying a diving board that could affect your enjoyment or your wallet in a big way. Avoid accidents or fines by checking out diving board–related building codes and your insurance policy provisions before installing a new diving board. Some insurers won’t cover liability related to pools with diving boards (or slides) at all. This means if you or anyone else is injured in your pool, the expenses related to that injury may have to come out of your pocket. Other insurers may raise your rates—or even drop you entirely—if your pool has a diving board or you add one. Before you start shopping for your diving board, check with your insurer to make sure you’re in compliance with whatever they require to keep you covered. If they won’t cover the pool at all, you may be able to add an umbrella policy that adds liability coverage for your pool. Disclaimer: We are not insurance experts. Always check with your insurer before making any large purchase decisions for your home, for a diving board or any other addition. Do your due diligence to ensure you’re protected in the event of an accident on your property. We can’t stress this enough. You may have seen the acronym ANSI/APSP when looking at safety ratings on pool products. The Association of Pool & Spa Professionals (APSP) is part of the American National Standards Institute (ANSI). Together, the organizations develop standardized pool safety measures and ratings for products. APSP also teamed up with the International Code Council (ICC) to create worldwide standards of safety for pools and spas. This document goes far beyond things like weight limits and handrails. It covers every aspect of pool safety you can imagine, from proper drainage to energy standards. It has recommendations for residential inground pools, as well as hot tubs, splash pads, and community pools. If you can get wet in it, the International Swimming Pool and Spa Code™ (ISPSC™) addresses it. Affix a permanent label to your diving board with the manufacturer’s name and address, date of manufacture, minimum diving envelope, and weight limit. Use only a slip-resistant diving board. Check the integrity of your non-slip covering regularly so you can repair or replace before an injury occurs. Be sure you have no pool features within the diving envelope. Place your diving platform flush with the pool wall so no one can hit their head. Follow manufacturer and ISPSC recommendations for diving board elevation above waterline. Mounting a board or platform too high can cause divers to hit the pool floor. 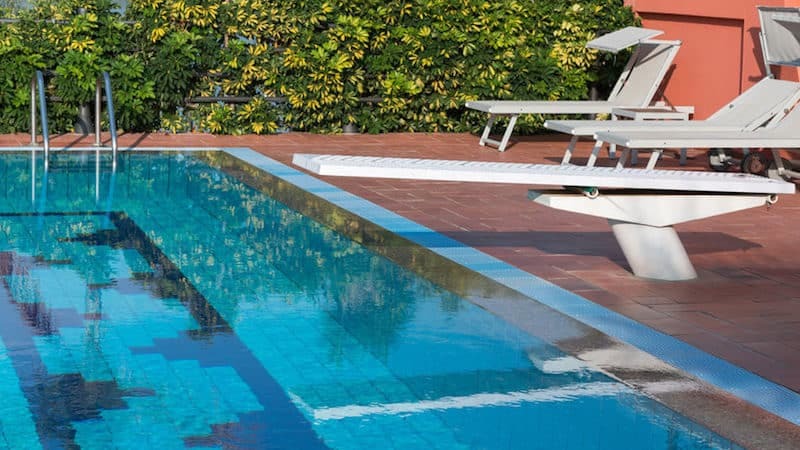 Some diving board manufacturers recommend professional installation of your new diving board so you can be sure the board is properly secured. Even a tiny error in installation could be the reason a diver slips and falls, or your diving board doesn’t last as long as it should. If you’re building a new pool or installing a diving board for the first time, you’ll need to install a jig—that’s a metal base installed under concrete. Your diving board is bolted to the it. Installing a jig is major construction and carries safety concerns which are best left in the hands of a professional. If you’re replacing an existing diving board, you’ll need to know the bolt pattern of your current jig so you can match it up with the diving board base you want. If you’re not installing a jig or if you can’t find a board with the correct bolt pattern, you can get an epoxy repair kit If you click this link and make a purchase, we earn a commission at no additional cost to you. designed for diving board bolt installation. You’ll have to cut off any previous jig bolts level with your pool deck. Then you’ll drill new holes into your deck in the pattern required for your new diving board, pour the epoxy in the holes, then insert the new bolts. Once fully set, you’ll be able to put your new diving board base on the newly installed bolts. The final concern when adding or replacing a diving board for your pool is local building codes. These vary from place to place, so you’ll need to check in with your local code enforcement office. Codes regarding diving boards typically contain the same kind of regulations you’ll find among safety recommendations in the ISPSC, such as ensuring all pool accessories are outside the diving envelope and affixing a permanent label with important info to your board. You’ll also come across codes aimed at contractors and builders which may not apply to you, such as the minimal required distance between springboards and overhead wiring. If you’re not sure which codes you need to adhere to, ask your code office. And again, you can always hire a pro to do the installation for you. Choosing the perfect diving board for your inground pool requires so much more than just a keen eye for sleek design. You need to check with your insurance company, be sure to measure your pool correctly, or even hire a pro. But it’s well worth all the effort to be sure you make the right choice that’s going to provide your family and friends with a fun way to jump into the pool without injuring themselves. All that’s left to do is dive right in!